El Salvador's national bird is el Torogoz, which is easier to say and remember than its English version, the Turquoise-browed Motmot. 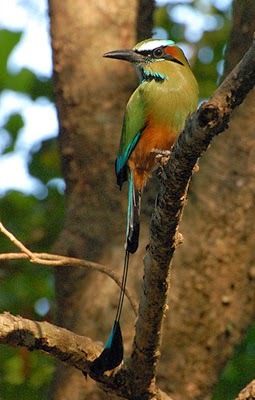 The Turquoise-browed Motmot (Eumomota superciliosa) also called Torogoz by the inhabitants of El Salvador, Guardabarranco in Nicaragua, and the Toh in the Yucatán Peninsula, is a colourful, medium-sized bird of the motmot family, Momotidae. It inhabits Central America from south-east Mexico (mostly the Yucatán Peninsula), to Costa Rica, where it is common and not considered threatened. It lives in fairly open habitats such as forest edge, gallery forest and scrubland. It is more conspicuous than other motmots, often perching in the open on wires and fences. From these perches it scans for prey, such as insects and small reptiles. White eggs (3-6) are laid in a long tunnel nest in an earth bank or sometimes in a quarry or fresh-water well. Its name originates from the color of its brow, turquoise. Los Torogoces was also the name of a musical group performing revolutionary songs during El Salvador's civil war. Hear them here.